Water for drinking (cold/hot, machine with gallons and bottles), tea and filter coffee. Unless under a special agreement, the vessel will cruise within Croatian territorial waters according to a suggested route. The captain can modify the routes in the event of bad weather conditions or in the event of it being objectively impossible to put in to a planned harbor. Half board is obligatory. 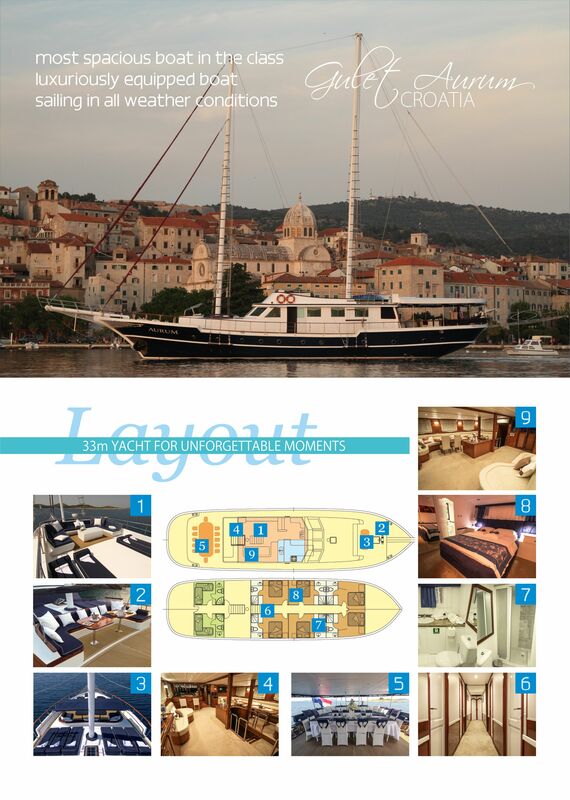 The price of 330,00€ person/week includes breakfast and lunch. Water for drink is included in price during whole day. Breakfast (approximately) from 8.00 to 9.00 hrs and lunch from 13.00 hrs to 14.00 hrs. Dinner from 19.00s to 21.00 hrs. Full board is agreed for a price of 520,00€ person/week. Full board includes breakfast, lunch and dinner. Full board is optional. Children up to the age of 10 years have a 50% discount for Full board and Half board. Children under the age of 2 years travel free of charge. Drinks, beverages and extra meals are paid by the client to the waiter or captain according to the given price list. Clients are not permitted to bring their own drinks and beverages onto the boat. Clients may not bring their own food on board if it is not explicity permitted by the terms of the contract. The bar is open until 00.00 hrs. The company is obliged to equip the boat with all necessary food and beverages. All special demands must be made before cruising. 7. In the event that the vessel is unable to put out to sea, the Company will offer an alternative vessel – of the same or even better quality. In the event that the alternative vessel is of lower quality than the reserved one, the price will be reduced to reflect the difference in quality. The company's liability, of any kind, is limited to the cruise price. In the event that the Company is unable to provide an alternative vessel, the Company may take up to 24 hrs to repair the original vessel. During this time all complaints of client are not acceptable. -	100% of the total price for cancellations within 30 days prior to embarkation. The client and Company can find an alternative arrangement with the same terms and conditions as in this agreement. The company shall not be liable for any curtailment of the holiday caused through fault or reason of the passengers. No refund shall be made in the event of curtailment of the holiday once it has commenced, however caused, nor shall the company be liable for any consequent expenses incurred as a result of curtailment. The company reserves the right to cancel or alter the holiday arrangements should unforeseen circumstances require it. Should cancellation be necessary before embarkation, the Company will, if possible, offer an alternative holiday or will alternatively make a full refund of all money paid. The Company is obliged to end the cruise in the harbor agreed in the original planned route. In the event of badly weather conditions, the Company may end the cruise in the closest place with public transport. Company liability of any kind is limited to the cruise price. 10. All additional payments will be pay at the end of the cruise to the captain or any representative of Company according to the price receipt. 11. The passengers are due to hold on to the captain’s rules regarding the safety of the yacht and the well being of all passengers on board. The boat cruises only during the day - not at night. Only by an explicit arrangement with the Company or as a matter of necessity can the vessel cruise during the night. Smoking below deck and in the cabins is prohibited, the passengers are obliged to abide by the Croatian rules protecting the environment as well as rules governing fishing and diving. 12. Working time for crew is until 0.00 hrs at the latest (after that it is additional work). 13. Note that you are on a wooden boat that some raindrops can come in. On check in crew show the clients function of toilets and in a case of throwing unacceptable objects boat may lose a lot of time in port to fix again system. That can not a legitimate cause of complaint. 14. Embarkation is after 5.00 PM on the day of arrival and disembarkation is before 9.00 AM on the day of departure. 15. The agency or client are to report to the Company if clients have some malady (chronic or contagious allergies) also if clients have any dietary requirements. 16. All remarks or suggestions can be solved by agreements with the captain or directly with Company's representative. Unresolved complaints must be made in writing before the end of the cruise or immediately upon disembarkation. In the event of a dispute being taken to court, the competent court is in town Šibenik, Croatia. 17. These booking terms and conditions are part of the contract and are accepted with signing a contract or consenting to cruise (paying after an offer or emabarking on a boat without a contract, ordering a cruise with an agency, etc).